Less than 3 Less than 3 3 - 10 ? 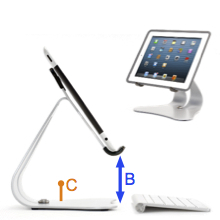 This technical calculation quantifies the stability of an iPad stand. The factors are, the weight of the stand, where the weight of the stand is, and how tall the stand is. The lower the factor number the more stable your iPad will be in the stand and the less likely the stand will tip over. How do we find this number? We calculate the elevated height (B) at the bottom of the iPad and multiply this by the calculated distance for center of mass (C) from the bottom of the stand. Then we divided that calculation by the weight (A) of the stand. Works with Case or Skin Yes Yes ? (No need to adjust a mechanism to hold tablet) Yes Yes ? Tablet Elevated Height from Table, inches (B) 3.625 5.500 ? (Calculated / engineered distance from bottom of stand. Smaller dimensions equal better stabilty of the stand.) 1.50 1.55 ? Stability Factor (BxC/A) 2.36 2.70 ? 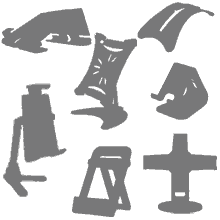 Material Solid Steel Solid Steel ? Material Thickness .120" .179" ? Viewing Angle Fixed 55˚ Full Pivoting 10˚ - 100˚ ? Steel Ball Joint, Adjustable N/A 3/4" ? Finish Silver, Black, White, and more Silver, Black, White, and more ? Consumer Warranty 2 Year 2 Year ? Elite Series Stabile iPad stands have a slender artistic style with every bit of thought into your use as well. We believe that a product design also needs to be easily used with daily use, otherwise we failed. This requirement also includes efficiently using the Stabile iPad stand with any case or skin. Elite Series Stable iPad stands are stable and massive, made from 100% solid USA steel. There is no compromise with this material, the strength that is achieved with a design from solid steel allows for the best rigidity and superior feel while using your iPad. Using virtual design modeling, the finest heavy raw materials, and advance production equipment, we produce the Elite Series Stabile iPad stands with integrity to meet our achieved strict quality. 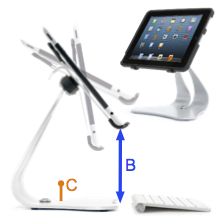 Elite Seriers Stabile iPad stands meet your ergonomics requirements with proper elevation. Having the iPad higher up is more ergonomically correct, and therefore more comfortable to use. You deserve that.